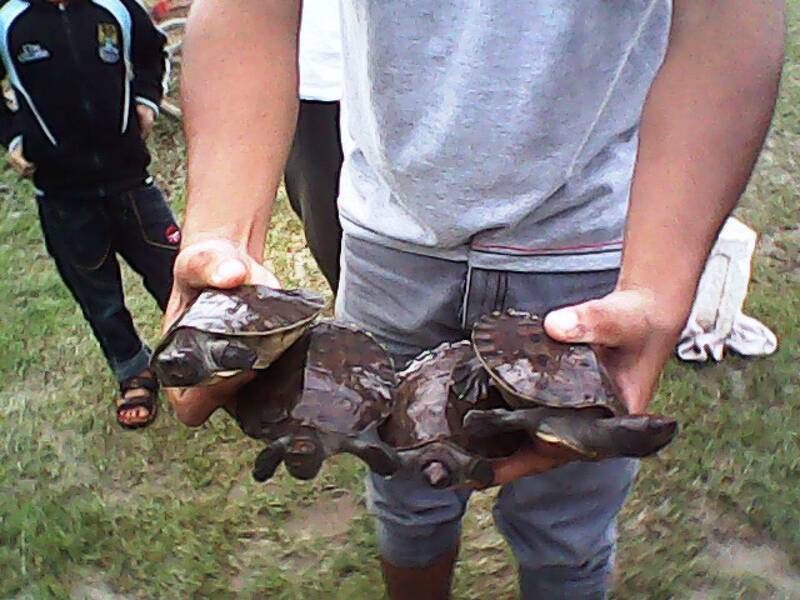 A total of 77 hatchlings of Painted Terrapin ( Batagur borneoensis ), critically endangered species, was released in to native habitat in estuaries in Aceh Tamiang District, Indonesia ( 3/10/013 ) . These seven month-old hatchlings are a result of survey and nesting patrol carried out by rescue team of BKSDA Aceh Tamiang , rangers of Aceh Tamiang Forestry Office, Satucita Foundation and supported by Pertamina in the period of December 2012 to early January 2013 . In habitat , eggs of Painted Terrapin are harvested by villagers for consumption. Therefore, rescuing, hatching eggs , raising the hatchlings and releasing to nature is very important to increase populations in the wild . Survey and nesting patrol activities was carried out during in that period , successfully rescued 180 grains . Hatching was carried out by using a foam box filled with sands. Each nest was moved one foam box . However , Only 83 were hatched , two of them are handicapped . Meanwhile, the rest were failed to hatch because infertile. A week after hatching, four hatchlings died. So, only 79 hatchlings that live up to the enlargement. Of 79 hatchlings that live and raised in two rearing ponds sized 7×4 m and 4×3 m , two hatchlings are not released into the habitat because they are handicapped. Considering that the hatchlings would be difficult to feed, move and survive in the habitat , then they are not released . At the time of releasing , average carapace length ( SCL ) is 11.3 cm , the average carapace width is 9.8 cm and the average weight is 221 grams . At the time of early measurement, average carapace length was 5.4 cm , width 5.1 cm and the average weight is 41 grams . Thus, for about six months , the hatchlings carapace length are increased by 5.9 cm , while the width is about 4.7 cm and a weight 180 grams. During the six months grew up , the hatchlings are fed with fruit of mangrove ( Sonneratia sp . ) , shrimp and water spinach (Ipomoea sp). This natural diet will ease the hatchlings to adapt in habitat. In a speech at the releasing event , the Chairman of Satucita Foundation invites all elements of society to support the preservation of this critically endangered species according to the IUCN . 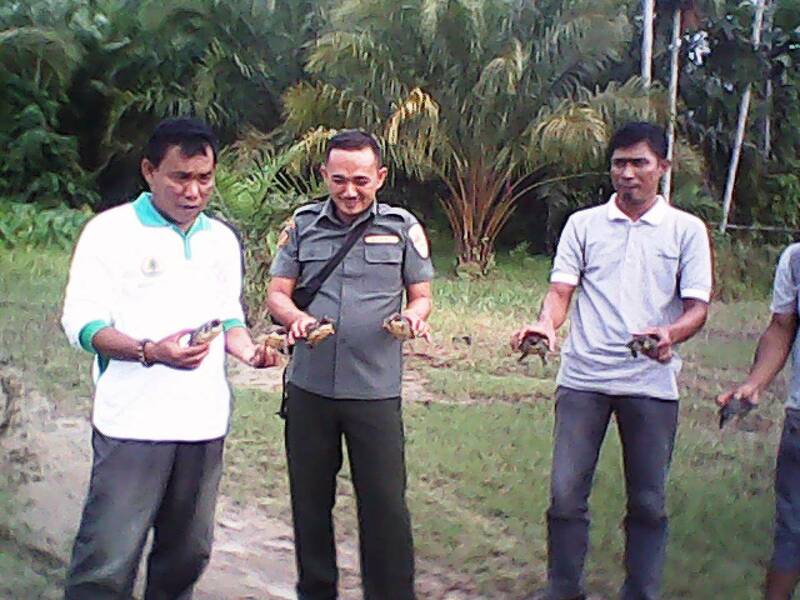 Commenting on Painted Terrapin , Secretary of Aceh Tamiang Forestry and Plantation Office, Ir . H.Muhammad Zein, said ” Activity over the mangrove conversion and poaching for consumption has caused a decline of Painted Terrapin population. Moreover, once the egg hunted for economic interests and consumption without considering its sustainability, obviously will accelerate its extinction ” , said Muhammad Zein . Muhammad Zein expressed full support of the Local Government of Aceh Tamiang towards Painted Terrapin conservation activities initiated by the Foundation in Aceh Tamiang. On the occasion, Assistant Manager of Health Safety Security and Environment ( HSSE ) PT Pertamina Rantau Field ,Bukit Hari Laksono, said that PT Pertamina remains committed to support the conservation of this species in Aceh Tamiang . Meanwhile , contacted separately , head of the Natural Resources Conservation Center ( BKSDA ) Aceh , Ir Amon Zamora MSc , stated that the preservation of wild animals and plants is the responsibility of all elements of society and rescuing eggs, hatching, raising and releasing is a form of engagement of public awareness and commitment shown by Satucita Foundation. ” Painted Terrapin is a very critically endangered species which ranks 25th in global scale, published by Turtle Conservation Coalition. Of the 25 turtles are the most endangered globally , there are 6 species which live in Indonesia ,Painted Terrapin is one of them . Painted Terrapin is instrumental in dispersing the seeds and nutrients for the mangrove ecosystem . Going forward , we will continue to enhance cooperation with BKSDA Aceh , government , communities , private sector to increase the population of Batagur borneoensis. Do not let local extinctions that occurred in other areas is also happened in Aceh Tamiang . We give a positive appreciation for BKSDA Aceh , Aceh Tamiang Forestry Office, Pertamina, Turtle Survival Alliance, local community to support the conservation of this species” , added Joko Guntoro , founder of the Satucita Foundation. Attending the event , Chairman of Satucita Foundation, Secretary of Aceh Tamiang Forestry Office , Ir.H.Muhammad Zein, head of BKSDA Tamiang , Azharuddin , Head of Seruway Police Office represented by Chief of Provost, Aipda Provos Chief Unit , Commander of Seruway Military Office, head of some villages in Seruway, villagers. While the PT Pertamina represented by Assistant Manager HSSE , Bukit Hari Laksono , Assistant Legal And Relation, Jupri , Pebransyah and his staff . We would like to thanks to Turtle Survival Alliance, PT Pertamina EP Field Rantau, Turtle Conservation Fund, Local Government of Aceh Tamiang, Villagers for their support for Painted Terrapin conservation initiative here.